I don’t often buy magazines but this one shouted ‘buy me’ from the rack in WHSmiths. Take a look at the headings at the bottom and you’ll see why. It’s quite a sweet magazine which I enjoyed reading. I do appreciate the simple things in life so this idea appealed to me greatly – although there was still a heavily consumerist angle which seemed to contradict their ethos somewhat (although I accept that this is how magazines survive). Printed media is having a huge resurgence (rather like vinyl) and there are some really beautiful publications around at the moment. Anyway, I spied and saved this ‘hand-me-down recipe’ to try (which I believe was from Rachel Allen – in cutting it out I lost the reference). If you like the peppermint/chocolate combination (think After Eights, mint choc chip ice cream etc) then you’ll love these. I would describe them as a cross between millionaire’s shortbread and Kendal mint cake. However, unlike millionaire’s shortbread these are pretty easy to make. I’m the only one in my family who is not a mint choc chip fan so I thought I’d be immune to temptation with these. Memories of making vile peppermint creams at primary school has put me off the smell of peppermint essence forever. However, having tried a small bite of one (for the sake of research) I have to say they are surprisingly delicious – which is both good and bad at the same time. Line a 20 x 20 cm square tin with baking parchment. To make the shortbread, measure the flour, softened butter and sugar into a bowl and rub through your fingers until well incorporated and breadcrumb like. Press the mixture into the tin and bake in the oven for 25 minutes until golden. Leave to cool completely (you can speed this up by putting it in the fridge if necessary). To make the peppermint cream, add the 75g of softened butter, icing sugar, milk and peppermint into a bowl and beat with a hand held electric mixer until fluffy. Spread the mixture onto the cooled shortbread using a palette knife dipped in warm water to get the surface as level and even as possible. Chill in the fridge for 30 minutes. Melt the dark chocolate in a bowl over a saucepan of simmering water, or in the microwave. Tip this over the top of the peppermint cream and level off with a palette knife and place in the fridge until hardened. Cut into squares with a very sharp knife as neatly as possible. You’ll notice that mine are a bit messy but this didn’t seem to ruin the taste. A random photo of my first crop of homegrown basil which has just been whizzed up into pesto. Try to ignore the slug holes. Sorry but I’m having a lazy August blog-wise – this is mainly due to the children being off for the school holidays which means I just don’t have the head space for writing anything. Despite this though I just had to take the time to tell you about a new food revelation of mine. 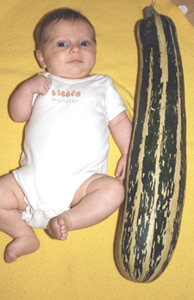 I while ago, when searching for courgette recipes on the internet, I read about a type of Italian pizza with zucchini as a topping. I dismissed the idea at the time because I thought it sounded horrid. I imagined watery, anaemic looking courgettes making the dough go all soggy. 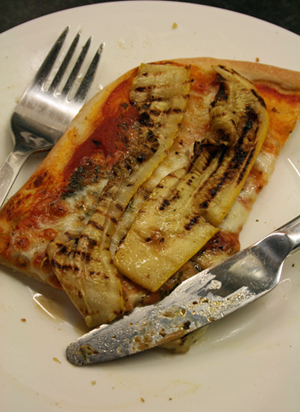 But I recently made a griddled courgette salad to go with a margarita pizza (I had no other salad items in my fridge and was drowning in a sea of them) and realised that if you piled the courgettes on top of the cooked pizza it actually tasted very, very nice indeed. 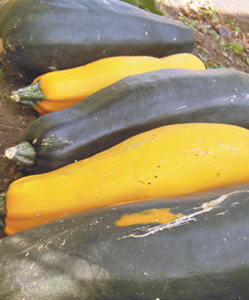 So for anyone with a glut of courgettes, I urge you to try this. Cut several medium courgettes into slices length-ways as finely as you can without chopping off your fingers. Season with salt and pepper and brush each slice on both sides with olive oil. Then place on a griddle pan over a very high heat for about 5 minutes each side (or until soft and slightly scorched). When cooked place in a bowl and cover with cling film. When you are ready to serve drizzle over a little olive oil and lemon juice (you may also need a touch of extra salt and pepper), then toss around in the bowl so that the flavours mingle. I wrote about homemade pizza nearly a year ago now in my post ‘Basic pizza dough and two ways to use it for a Saturday night tea‘ but if you missed it here’s a recap. 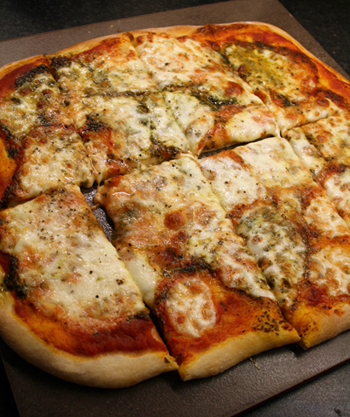 Put the flour, salt, yeast and olive oil in a mixing bowl and add the water gradually mixing with your fingers. You want to bring the mixture together into a fairly wet dough – you may not need the whole 250ml. If you add too much, and the dough is too sticky to work with just sprinkle on a little more flour. Tip the dough on to the work surface and knead until the dough is smooth and elastic. Ideally you should knead for at least 10 minutes but I have little patience and am usually in a rush so it tends to be more like three and the results are just fine. Put the dough back in the bowl, cover with cling film, and rest for at least 1 ½ hours (although 2 hours is better). After this time take off the cling film and give the dough a good punch to knock out the air. Transfer to the work surface, knead lightly for a few seconds and divide into two (as this recipe is enough for two bases). Set your oven to its highest temperature (mine goes up to 270oC) and place two flat, square trays in the oven to heat up. Rolling out the base can be tricky as pizza dough is very elastic. It resists being stretched and wants to spring back so this part can feel like treading water. My technique (which seems to work) is to stretch the dough carefully with my hands first before using the rolling pin. When you have made a round of about 20 cm by pulling in all directions with your hands, liberally flour your work surface and a rolling pin and roll the disk until the dough is really thin and large enough to fill your baking tray. Repeat the process with the second portion so that you have two bases. Place the rolled out pizza bases onto two heated baking trays. Smear the bases with some tomato passata (I sometimes make my own, but when lazy use the ready-made stuff in a carton). Tear up some basil leaves or drizzle over some pesto, then slice two packets of mozzarella cheese (170g balls) thinly and place evenly on top. Bake in the oven for about 10 minutes or until the base is crisp and the cheese is melted and browned. 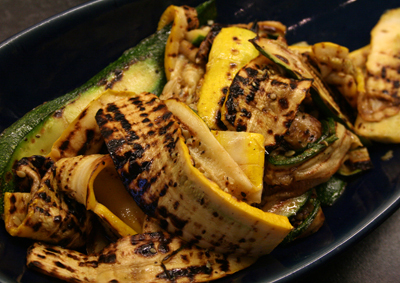 Serve the pizza with the griddled courgettes on the side but eat together as below. It’s that season down at the allotment when all the hard work pays off and everything seems to be ready to eat all at once. It’s both a joy and a bit of a stress. Because I just hate waste I fret about trying to use up everything but sometimes there just don’t seem to be enough meal times in the day and I’m already bombarding my friends and relatives with hand-outs. This is where pickling and preserving comes in. My friend ‘Little Ben’ first introduced me to pickled eggs at the end of a drunken night out in Nottingham and I have to admit I was not a fan. These pickled beetroot eggs however are truly delicious. The beetroot makes them lovely and sweet and the pinky colour of the eggs is just wonderful. I like to eat them on their own, sliced in half with a blob of mayonnaise and salt and pepper. They are also really good cut up in a Russian style salad with their pickled beetroot neighbours. Cooked beetroot skinned and chopped into chunks (I cut medium sized beetroot into quarters). To cook I scrub the beetroot gently and roast them in their skins in a foil envelope for an hour at 160oC fan. Sterilise a big jar (750ml mayonnaise ones are good) then cram in the cooked beetroot and the eggs layering the two throughout the jar. I put the vinegar, sugar, bay leaves and peppercorns into a small saucepan and bring to the boil. 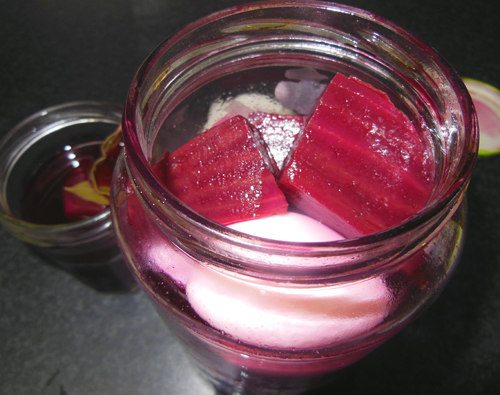 When the mixture is piping hot and the sugar has dissolved I tip the vinegar into the jars until the eggs and beetroot are completely immersed. I then pop on the lids of the jars and leave to cool. Leave the jars for at least a couple of weeks in the fridge before using. Pesto is so easy to make but it’s difficult to give exact quantities for this recipe as it will depend on how much basil you have available at the time and it’s quality. Once you’ve whizzed up the basil leaves in a food processor with a good glug of olive oil to help things along (I have one of those mini choppers like this one http://www.cuisinart.co.uk/mini-processor.html which works well) you just need to add the other ingredients a little at a time until you have the right balance. 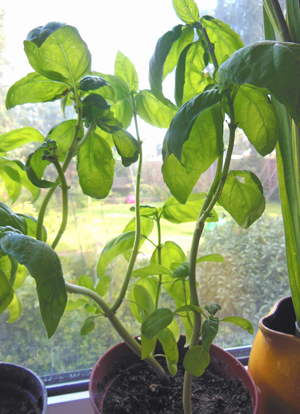 If you’re basil leaves are a bit long in the tooth then you will need to use quite a lot of olive oil. You will also need a lot more basil than you may think. One shop bought basil plant will only make the tiniest jar of pesto so it really is best to grow your own. I drive my family mad by growing plants on every window sill in the house as well as in huge tubs in the allotment greenhouse. Keep your pesto in a sterilised jar in the fridge with a fine layer of olive oil on the top to stop it from turning brown. I’ve never actually managed to keep any long enough for it to go off in the fridge but it should keep for at least a month or two. I always add parmesan cheese to the pesto before tossing with pasta but I find that if you jar it with the parmesan added then it impairs the flavour. A couple of years ago we bought a small lovage plant from our local garden centre in a 4 for 3 offer on herbs. We didn’t have a clue what it was at the time or how it could be used. 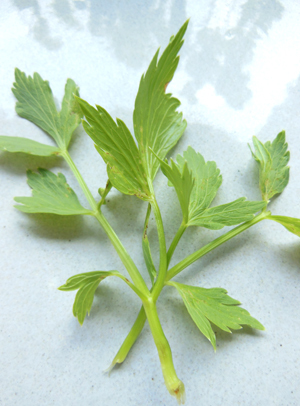 Lovage is said to be similar to celery in flavour but personally I think the taste is unique and I absolutely love it. The plant has grown to over a metre high and takes centre stage in our herb bed. Because it is so plentiful in the early part of the year when the basil on the window sills and in the green house is only just germinating we thought we’d try a pesto made with lovage instead of basil with the same additional ingredients as above. You will probably need a bit more olive oil than for a basil version and it’s a very strong flavour but used sparingly and mixed into pasta with plenty of parmesan it is delicious.